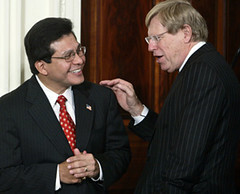 Today is Alberto Gonzales' last day as Attorney General of the United States. Who will replace him? Joe Conasen at Salon wonders whether Bush would dare to nominate Ted Olson. Reporter Matt Cooper, who hired Olson for his Supreme Court appeal in PlameGate, praises Olson. Peter G. points out in the comments here, the valid reasons for not appointing Ted Olson are not his politics, but any lapses in his integrity, principles and competence. Criticism should be leveled at him for his own actions, opinions and choices rather than our opinion of his clients. Even before his dubious and much debated connection to the Arkansas Project and Richard Mellon Scaife, Ted Olson had issues. Big issues. Check out David Neiwert's Salon article from May, 2001 when he ran into Judiciary Committee opposition during his confirmation process for Solicitor General. In the mid-1980s, he became the focus of an independent counsel's investigation for much the same thing: giving misleading testimony to Congress -- some charged it was perjury -- that was intended to cover up his own misbehavior. A careful examination of that episode raises serious questions about not merely his integrity but the legendary legal prowess to which even his critics defer. Indeed, the last time Olson served as a top presidential legal counselor, he left behind a political disaster area strewn with bad legal advice, wrecked careers and lingering scandals. Harsh words, but read the article and decide for yourselves.